Remember those challenges that I mentioned? Well, I’m starting challenge #3. One of my dear colleagues is retiring, so let the festivities begin! Today, we had a wonderful going-away party for her, full of lots of wonderful meats (prosciutto, capicola, salami) and cheese (my favorite, goat cheese, mozzarella, cheddar, and more), mac and cheese, pasta salads, soups, deviled eggs, carrot cakes, cookies, brownies – you name it, we had it, and everything looked delicious! There were probably some things at the party that I could have had (tabbouleh, guacamole, veggie platter), but instead, I stuck with my Ultimate Reset lunch that I brought into work that morning. 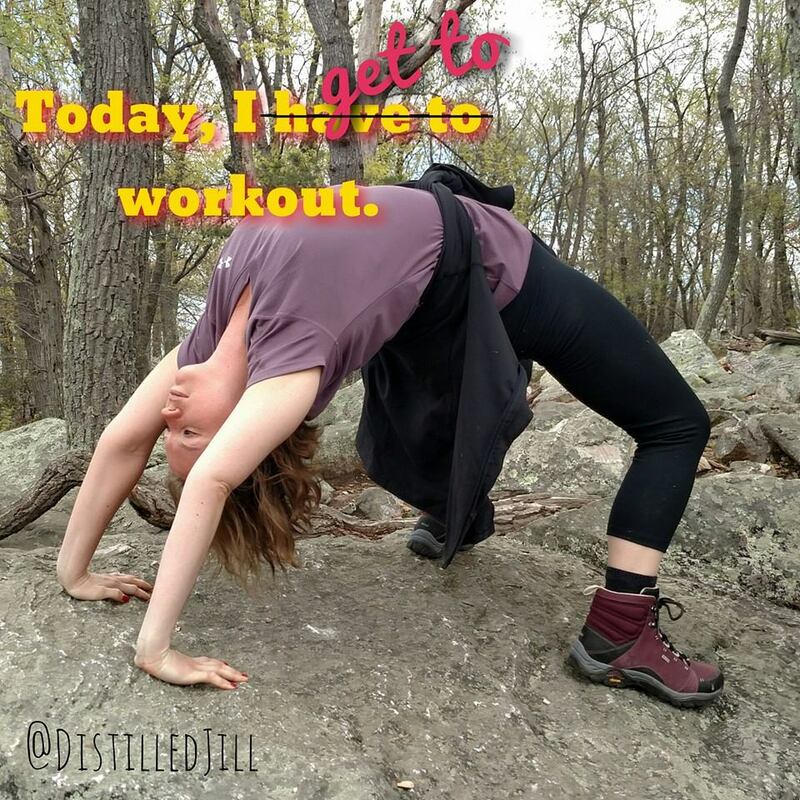 After I helped set up the party, I quietly sneaked back to my office, ate my lunch, and then returned to the party on a full stomach and without temptation. Didn’t have any of it (even though I’m pretty sure I could’ve). Tomorrow, we are taking our retiree out to dinner, and I have a particular dish in mind from the restaurant’s menu that I am pretty sure is Reset-friendly. So, I might take a much-needed break from cooking tomorrow afternoon, and let someone else make me something for a change, though I will be careful to stick to the Reset. Then, Challenge #3 will be complete! One odd thing that I’ve been experiencing is that I feel like my sense of smell is changing during the Reset. I first noticed this with the smell of cigarette smoke. I used to not mind the smell of cigarette smoke at all. While I wouldn’t say I mind it now, it smells different and less comfortable to me. Well, it smells like dirty feet and stale popcorn now. Likewise, at this afternoon’s party, the smell of the room with all of the food in it, with all of the meat and cheese, just smelled kind of sour and unpleasant. Strange. The breakfast today was a little different. It was basically hummus minus the tahini. Seasoned mashed chickpeas with nori gomasio. 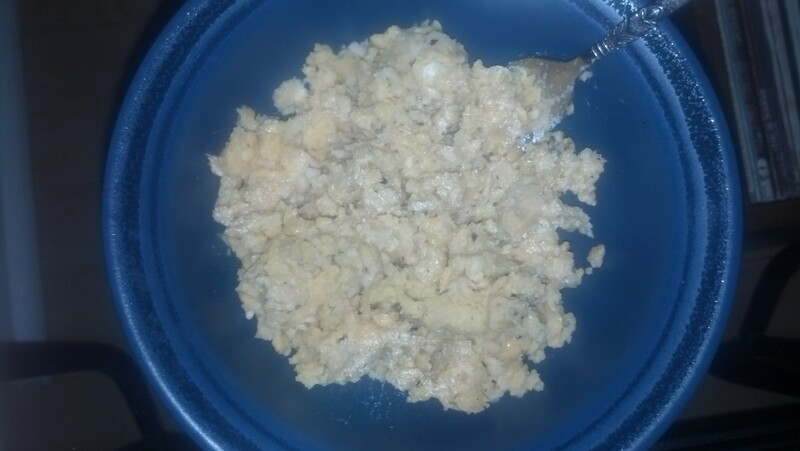 Nothing better than raw garlic first thing in the morning! Lunch was a half serving of the pinto beans and brown rice that I made for dinner last night. Always make sure to look ahead to the next couple of days when you do the Reset to ensure that you can double recipes that you will be using again the near future. The pinto beans were paired with a microgreen salad. This time, I tried baby arugula for my green, and I must admit, not much of a fan. It was a little too bitter for me. Plus, I forgot to add dressing to the salad this morning. Dinner was frenzied. We had theater tickets for tonight (thank god, for the cabin fever associated with this Reset has been brutal). After staying a little late at work, my husband volunteered to go out and pick up enough groceries to get us through the next couple of days, which includes a concert tomorrow night and the 24-hour movie marathon on Saturday (so, a lot of prep work needed). He also agreed to cook tonight’s dinner. 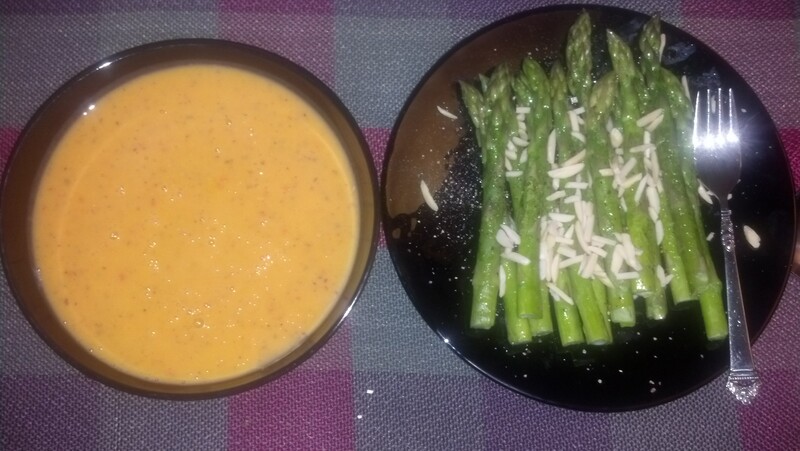 The dinner for tonight was sweet potato and red pepper bisque and roasted asparagus with slivered almonds. Roasted asparagus is easy, but a bisque?! Well, my husband, who pre-Reset could hardly boil Ramen Noodles, whipped up the bisque perfectly. It was pretty amazing, and I am so proud of him for learning how to cook a couple of things during the Reset. His other specialty is miso soup. I think he might have a knack for the soups. Since we were in a rush to get to the theater, we did not have time to actually roast the asparagus, which was a total bummer to me because I adore them roasted. Instead, we opted to steam them. Still pretty good. Word to the wise – double up on that bisque. You eat it again for lunch tomorrow!